Today I simply want to say thank you. in a bicycling accident in October. and it was very comforting and heart warming for me. he is doing very well and we are astounded at his remarkable recovery. by filling in for me here at 365lessthings while I sat by his bedside. I decided to offer her a weekly post and she accepted. So welcome on board Cindy. as you are generating comments, tweets and links from readers all over. and for simply dropping by to read and comment on a regular basis. 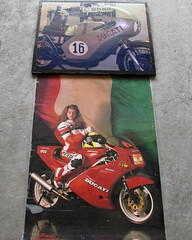 Motorcycle posters that have hung around but not on walls for too long. I won’t miss them. Cows – Where would we be without dairy products. I am glad I am not lactose intolerant. Recycling – It is nice to reuse or re-purpose things. Summer dresses – So cool and free flowing. Google – It is so easy to find out whatever you want to know these days. That’s what happens when you’ve created a caring blog community through your warm and welcoming ways, Colleen. I’m glad that your son came through the trauma so intact, and that you felt supported by your bloggy friends. And Yay! for Cindy helping out – and glad to know you’ll still be writing for Colleen! I is nice to know that what goes around comes around and that I have attracted lovely people like you. Maybe Liam’s amazing recovery also had something to do with Karma, I’d like to think so. And I say Yay for Cindy too. in return I have enjoyed every comment you have sent my way and am glad you have found a community here where you feel welcome. We have a regular group of very caring a sharing people like yourself that help make my blog everything I hoped it would be. So thank you. We are so pleased with Liam’s recovery and I wish you some of the same. I will say a little prayer that all goes well for you. Colleen, you are such a warm, caring and grateful person that I am not surprised that you have created a close circle of caring blogging friends. I feel very privileged to have been a part of supporting you and your family through prayer during Liam’s accident and recovery. I even asked for prayer at church one day for my friend, Colleen, whose son had been involved in an accident. Of course no one suspected that this friend was someone thousands of miles away who I had never met face to face or spoken to personally. But no matter, I still consider you a friend, and I think this incident with Liam has brought us all closer together as tragedies usually do. I am grateful that I stumbled across your blog when I did and that I became involved in this online circle of friends. Thank you for the opportunity to connect. As we say in Australia Thanks Mate! I consider you a friend too and I thank you for all the prayers you sent Liam’s way whether from you personally or through your church. The combined positive thoughts that came through to him made all the difference to his recovery I am sure. I am glad that you are part of the community here at 365lessthings and it is my pleasure to provide my blog as a meeting place for such a wonderful circle of like minded people.